Google has just announced the new Chromecast, with a funky hockey puck aesthetic and some improved internals and a hifi-specific Chromecast Audio to make your dumb stereo super-smart. It was inevitable that as soon as the Cupertino massive got its new Apple TV out into the wild, and Amazon had pulled the trigger on its Fire TV goodies, Google would get around to announcing a new Chromecast for 2015. Like its predecessor the new Chromecast is all about taking content from your existing devices and making your dumb TV a whole lot smarter in the process. To make that setup smoother, the new Chromecast is sporting redesigned WiFi hardware, now supporting 5GHz connections. That should deliver far better wireless performance, so long as there's not too many walls between the router and the Chromecast itself. But that extra WiFi performance will allow higher bitrate streams to be thrown at your TV without getting too bogged down in the buffering. We're still talking 1080p here - the devices you're going to be casting from are unlikely to be capable of outputting any higher anyways - but running on the 5GHz band should mean there's less lagging. To take advantage of the new higher-level streams Google is promising new service partnerships, with the likes of hi-res audio (HRA) kings, 7digital, getting involved early doors, supporting the new Chromecast Audio device. 7digital is a high resolution music streaming or download provider, with a huge catalogue of FLAC files. As part of its latest Android app update it's adding Cast support, the first to be able to deliver FLAC playback via the Chromecast and Chromecast Audio. 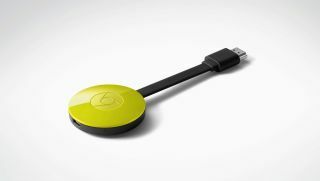 The new Chromecast disc design comes in the traditional black as well as lemonade and coral - exclusively available on the Google Store. But it's not just about looking different for the sake of it - the new design has been created to allow it to fit a wider range of TVs than the original, slightly restrictive device. By having that flexible HDMI cable forming the connection, rather than being an all-in, solid unit, it's not going to have the fitting issues that some TVs suffered with it. The fundamentals of the new Chromecast though are essentially the same, which can only be a good thing as the simple streaming device has been a huge hit with not just the gadget-gurus but the less tech-savvy too. Bringing that same simplistic streaming approach to the music world is a smart move too, enabling the audiophiles to bring their beloved off-grid speaker systems online with a simple dongle that just attaches to any aux/line input, RCA or optical input. The Chromecast Audio looks almost identical to the new Chromecast, though you're stuck with black as your only choice of livery. Simply cast your favourite audio apps to the Chromecast Audio and your stereo will do the rest. You can either go from the 'Cast' button in whichever app you're using or simply by mirroring your Android device. According to Google the Cast button has been hit 1.5 billion times since its launch two years ago. And if it can bring in even more audio and video services with high-resolution streams that's only going to increase. Both the new Chromecast and the Chromecast Audio will be available for just $35 (£30) when they go on sale today.